The machine is having round Tank with 6 head filling. The filling valves are specially designed to fill water from 250 ml to 2000 ml. The machine is provided with 9 head rinsing nozzle with Nine set of catcher for holding bottle which also allows the bottle to get washed from inside. The machine is having 3 sets of special capper, which tightens the cap of any mentioned size. The machine is suitable for filling any type of liquid, which has free flow density. As this machine is complete mechanical operated no compressor is required. 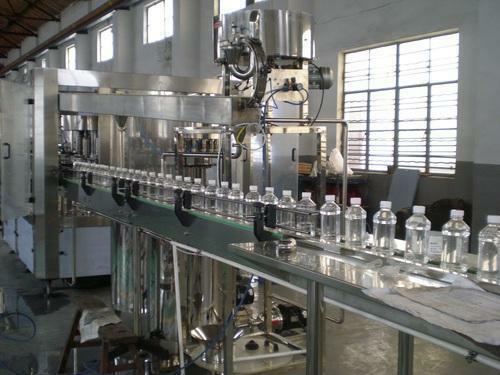 The machine is also provided with cap feeder, which has a capacity of approx 1800-2000 cap with U. V. Light system. The machine is provided with 6 feet Infeed Air Conveyor and 15 feet Outfeed motorized Conveyor for unloading the filled bottle with Inspection Board and Auto shrinking machine in line. We, Dharmanadan Technoprojects Private Limited established our operations in the year 2010, we have managed to attain a strong market position in Manufacturing and Supplying Trays & Storage Systems,as the well known manufacturer, wholesaler, and supplier of a huge collection of efficient RO Plants and Systems. Our product series comprises of Domestic R.O Water Purifiers, Domestic Water Purifiers, and Commercial RO Plants. Since our inception, it has been our strategy to offer superior quality products, and to ensure this we make use of fine quality raw materials in the manufacturing process of these RO plants, purifiers, and other machines. Our entire product range is made in adherence to the predefined industry standards and norms and we make sure that each product offers maximum functionality, high precision, and greater efficiency. To facilitate our operations, we have established a state-of-the-art infrastructure, which is equipped with the latest technology based machines and tools that support in the flawless production and storage of our products. It is because of our strong workforce that we are able to understand and fulfill the diverse requirements of our valuable customers, and offer them with the exact solution to their problems. In order to provide efficient products, our quality controllers conduct different tests examine the flawlessness. Products that pass this quality assurance process are delivered to the clients in a timely manner.